If a member misses a delivery you can credit their account for future purchases by adding a complimentary payment to their account. Start by typing the member's name into the search bar and then selecting their account. When their account appears select "Edit". Scroll down to the Payment Section. 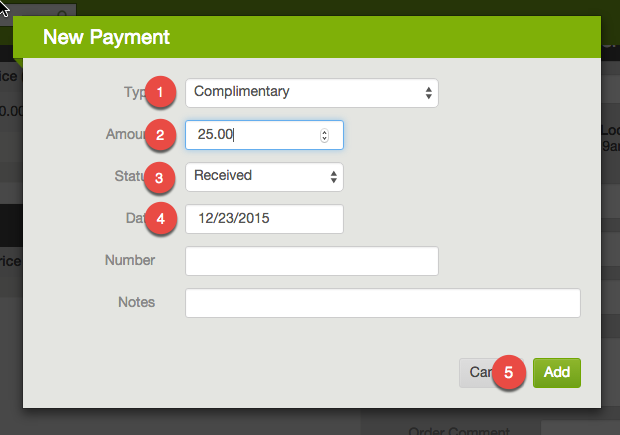 Push the +Payment button to add a complimentary payment. When the payment screen appears add in the complimentary payment. 1. Change Payment Type to "Complimentary"
3. Make sure the status is "Received"
4. The date should be today's date. 5. Push "Add" to apply the payment. Go back to the Top of the Page and Push Save. Their will be a positive balance next to the Member's Name.